Happy Holidays everyone! It's hard to believe we are closing in on the end 2016, what a year! We look forward to 2017 leading and learning with everyone. We wanted to end the year with a blog regarding TPS Generation 3. We bring it up in the last chapter of our book as "our" latest version of what TPS (Toyota Production System) means to us now and how our customers have evolved us and our thinking over the years. When we were introduced to TPS at Toyota back in the late 80's it represented the Toyota Production System, which was understandable at the time since TMMK was the first wholly owned plant for Toyota Motor Corp. We were part of something very unique and the infamous TPS house allowed us to translate the tools of the production system into our daily activities. Our trainers relentlessly coached us to think differently. As we grew as people and as an organization we realized internal and even external to Toyota that organizations that were trying to replicate TPS, that it wasn't as much about Toyota persay as it was the thinking behind the systems at Toyota. As time went on and some of the original trainers retired, a new group of trainers evolved and I often heard them refer to TPS (Gen 2) as the "Thinking Production System". In it's essence it is really true, we were always asked to think deeply about all the "systems running" in the background that created our climate or culture. There was a deep infrastructure reliant upon thinkers, as we discuss in the book E3 - we were always striving for the ideal state of Everybody-Everyday-Engaged!! As Ernie and I both grew in our roles after Toyota, spending countless hours studying how best to share and translate what we learned in those early years and how it allowed us to be the people we are today - that being 2 sponges! We are always soaking up as much knowledge as possible, to help individuals think better not only for themselves personally and professionally, but also be the change agent or the "model home" for their organizations. 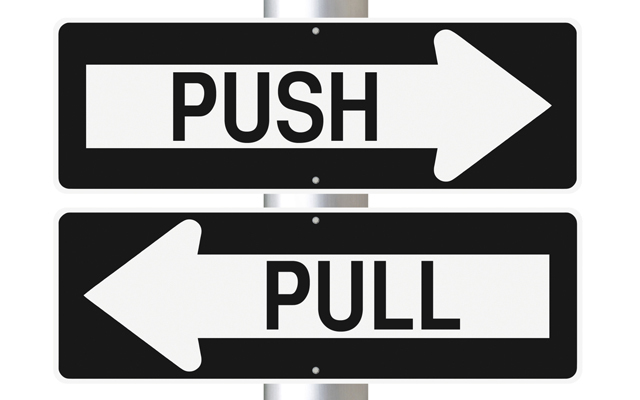 I know that was our goal at Toyota to always create a pull for learning through example, not a push. As the years have past and we continue to grow as people and coaches we learned there may be a next generation for TPS for us. (This is a Tracey and Ernie'ism!) - As we mentioned it is more than just Toyota in Gen 1, its also much deeper than Gen 2 with just "thinking". We would like to share our thoughts for TPS Gen 3 --- The "Thinking People System"!! Our sole purpose when we visit a client/customer is to begin to encourage people to think differently about what they do everyday. So we feel its fitting to evolve TPS to fit any organization that have people, processes, and problems. It can translate very well for you! So when you refer to TPS you can think about its foundational background, build on that and go to the essence of its creation! Thinking People~~!! PRE-SALES LINK Amazon books for "The Toyota Engagement Equation"
Hello everyone, sorry for my absence on the blog lately. 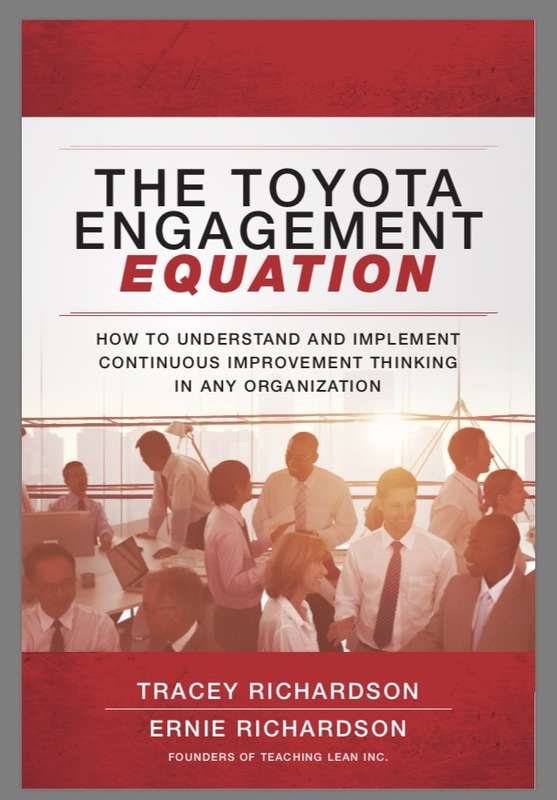 Ernie and I have been traveling quite a bit lately working with our clients, and when we are home we have been working diligently on our upcoming book in Q2 of 2017 - The Toyota Engagement Equation publish by McGraw Hill. We are excited to share our Amazon PRE SALES link with you!! Click here Pre-sales link to "The Toyota Engagement Equation"
Video clip from Lean Enterprise Institute Mining Gold with Kinross and Teaching Lean Inc. Check out this short video clip by Chet Marchwinski with the Lean Enterprise Institute at the Lean Summit this past March in Las Vegas. Chet is interviewing Kinross Gold who has been on a Lean journey now for several year, along with Ernie Richardson. Hello everyone, #crossblogging this month. Spent a week on a Q&A interview with the Lean Enterprise Institute extrapolating our thoughts and experiences from our time at Toyota and how we translate them to other across all different types of industries. Have a GREAT 4th of July weekend coming up!! Have you found the point of occurrence (poo) in your process? This post is to have a little fun while we learn, and if any of you have been in our sessions the past few years you will know what this means. It's the funny things that often allow us to remember important thinking as we learn and practice lean in our daily activities across all functional areas of our organization. We all should be familiar with PDCA (Plan - Do - Check - Action), its a systematic approach to problem solving among other business practices at a micro and macro level. In this blog we will focus a bit more on the micro aspect. So if you think of the 8 steps of problem solving we are looking at framing problems based on a proper go and see approach. We determine from as much data and facts what is our current state. This doesn't have to be manufacturing, it can be any process that creates an output, service, end result or product. 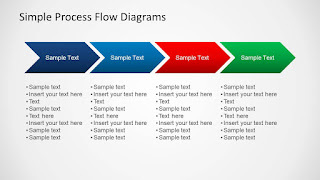 Material and Information (M & I) flow can be involved, or perhaps the "day in the life" of a document (hard-copy or e-copy), or a process of approval. Once we have determined our current state and measured it against a known standard then we should have a quantifiable gap. What we find is most are unable to measure effectively so assumptions are made and problem solving begins and our result could be from shear luck. As my trainers would say "lucky isn't sustainable" especially if we are running a business. This thinking allows us to only get a symptom of the problem not the root cause and it normally just returns. Also if we don't have a known standard, then start to document what should be happening in a process (based on customer internally and externally needs it to be). Often I refer to it as an Ideal state or expectation - believe it or not standardization is a perceived bad word in some organizations. I think for the most part we all can agree that we are doing "something" that creates our output, shouldn't we document it in order to improve? Doesn't Taiichi Ohno tell us that we can't have continuous improvement without a standard? So I encourage everyone to really look at how you frame problems in order to begin the shift from reactive problem solving to more proactive. Minimize the "fire-fighting" approach and reduce your hose-holders in the rear. Once we have determined our problem or gap properly we must think about slicing the data into manageable pieces. Please reflect back on one of my past blogs about breaking down the problem. How to breakdown a problem correctly! The day in the life of a document, product, or individual etc. An administrative process (how to apply for medical leave) or get approved for vacation time. As you can see there are many articulations of what a process can be, usually it consists of a step-by-step approach that leads me to an outcome. Now the question is, as an organization, where does the waste reside? Do we recognize it? Do we consider it an accepted norm? Do we develop work around's to embed it as part of our process? Does tribal knowledge cloud our thinking? All these are good questions we need to answer through a go and see and engaging with people who do the work in all areas of our company. As we teach in class, of course in a jokingly way, we ask have you discovered the point of occurrence in your process(es)? We often refer to as the POO? (Point of Occurrence). We say if you have stepped in the POO, you have found the discrepancy that is creating "pain" (translates to KPI's) to your organization. It could be in the form of quality, safety, productivity, or cost. Point of occurrence's are there it's up to use to think in the most granular form to find those wasteful steps and eliminate the POO, Just of late in the marketing world I have seen the Emoji's or Emojicon's come to life outside of our texting realm. I see these in the form of stuffed animals and often pillow size. We are in airports almost weekly and I ran across this little guy. Of course one of the popular emoji's we all have seen. This has become a "mascot" if you will within our sessions as a visual to know if you have found the point of occurrence (poo) in the process. Many laugh or smile, some roll their eyes but secretly think its funny. I guarantee its an engaging way to remember are you finding the actual step in the process where the point of occurrence resides. Because until you do, I promise you will continue to fight symptoms and your problems will continue to manage you, not you managing your problems. Which is more value add for your company? So use the Emoji in a completely different way than intended, it has a key chain latch so attach it to a process so the root cause can be identified. Make "lean thinking" fun(ny) and see how much more interesting it can be. It has been a little joke now in our sessions and we will be handing them out for the teams who find the most point of occurrences on a gemba walk! Whatever it takes to move the needle! Lighten up and LEArN! Keep calm, go see, and step in the point of occurrence! Why don't we solve problems like we eat pizza? So we have been conditioned since our youth that pizza normally comes by the slice, of course if we make our own we bake it then slice it, right? Perhaps you can describe this as tribal knowledge or a learned trait. I think many are familiar with that and have. In the world of Lean thinking or doing business with the focus on adding value and respect for our people, we need to put problem solving methodology into that same category as well. There is a misnomer out there that when we problem solve (using PDCA) that we must take on world-hunger level problems. Some, that are experienced in A3, tend to think putting a largely scoped problem into that format will help them solve it faster. Or should I say for some who may have minimal time, allow us to jump to countermeasures faster. Even at my time at Toyota TMMK, I caught myself being pulled into this vortex. 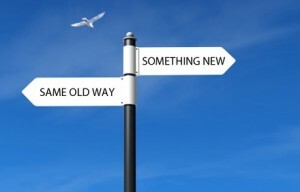 We often need the problem fixed or the results to change so taking it all on a once seems like a faster process. 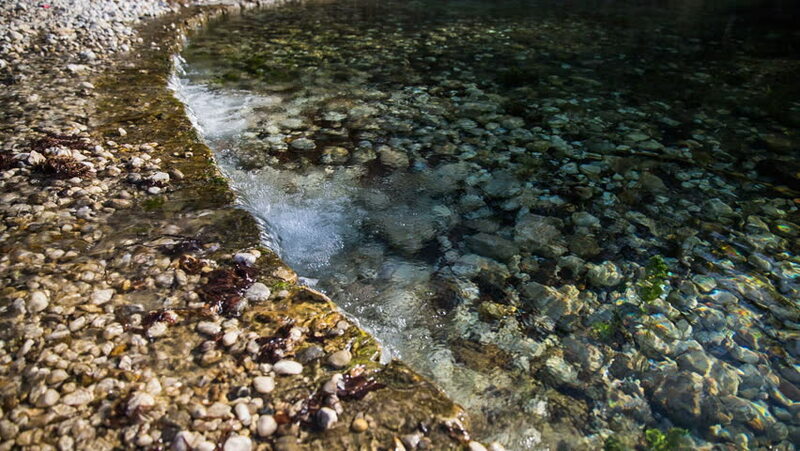 When you lower the water to see the rocks is it really faster? You can do the cost translation to your KPI's. 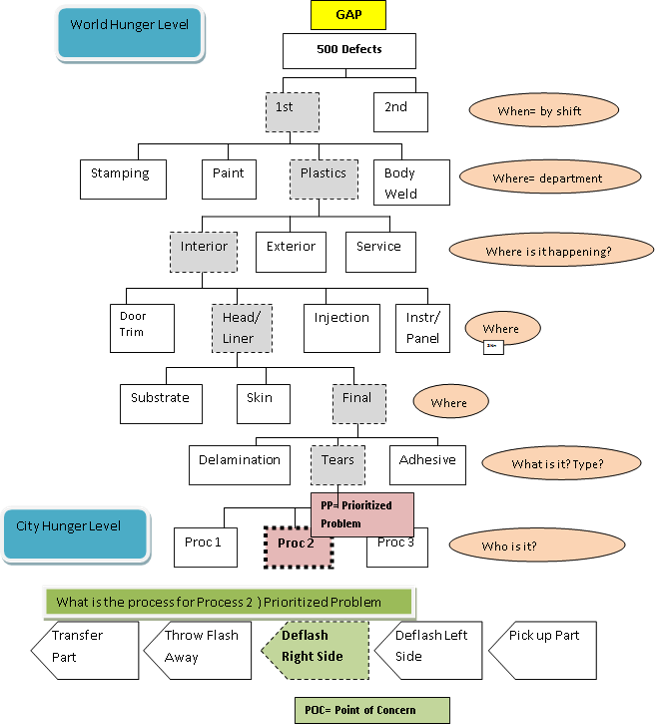 When I first was introduced to problem solving I will admit we often went from a larger measurable gap (difference between the current state and the standard) to asking why, usually a fish-bone diagram. 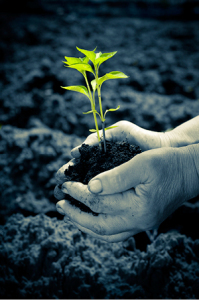 This process often reared us many root causes, more than we should change at one time to be honest. Many times we found ourselves outside of the Gemba trying to make the best selection based on assumptions, opinions and past experiences. This sounds good, especially if we have tenure in an area, but it's not a sustainable process - lucky at best as my trainers would remind me. As we all know when we trying to implement too many countermeasures at once it's very difficult to measure which one actually fixed it, and how do we know? So it's great if we can avoid rework and non value-added time if possible. As John Wooden as said, "If you don't have time to do it right the first time when will you have time to do it over?" When I was introduced 12 years ago, when I was an internal trainer for Toyota, to a new way to approach problem solving that developed an additional step in the process - the light-bulb came on for me. Imagine for a moment, a process that encouraged you to take the large gap you have after defining a problem, and breaking that down into manageable pieces. In essence you would slice the gap up into weighted (based on data) contributors to the overall gap. Similar to a pareto chart where the sum of the bars equalled the total amount of the problem. A tree diagram often works well visualizing the "funneling" of the gap into one slice. Similar to pizza. If we tried to eat this pizza in one setting without it being sliced it would be difficult for us on many levels. There may be a few that can accomplish the task, but it's not a preferred style of eating. Often times we would feel terrible afterwards, similar to the frustration commonly felt when we don't put problems to bed using true root cause analysis. If we just take a slice at a time as we have been conditioned to do eating, we should get down to a portion of the gap that takes you to a process level. 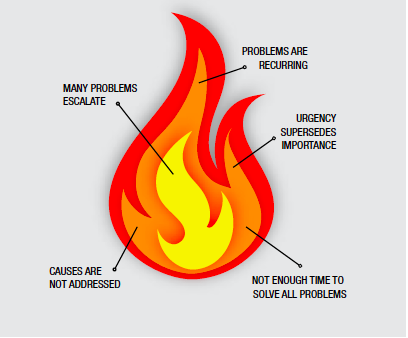 This process level allows you to be around 1-3 root causes maximum. If you find yourself with 5 or more root causes at an individual slice it should be a red flag indicator to lessen the size of the problem we are tackling. PDCA will talk to you if you use the process correctly and listen. Only when we try to take shortcuts and by pass people or the Gemba we fall in a potential state of frustration and band-aid fixes. Then the A3 gets blamed for being a terrible tool. Folks will say, "This doesn't work, why are we using it?" A mock example I use of breaking down a complex problem is below. It shows how taking a world hunger level problem and getting it down to a manageable "slice" which is a process I can influence and go see. Not just manufacturing but service industry and material and information flow style processes as well. So you can see the highlighted path down to one slice, which we can say is 40 of the 500 defects. This is a mock example so just allowing you to put some number to see the slice. 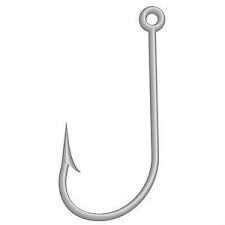 In our real world problem solving we would attach values to each of these so they track back upward to the gap. It not only illustrates our path of thinking but shows there was Gemba visits to differentiate facts from our beloved opinions and assumptions. 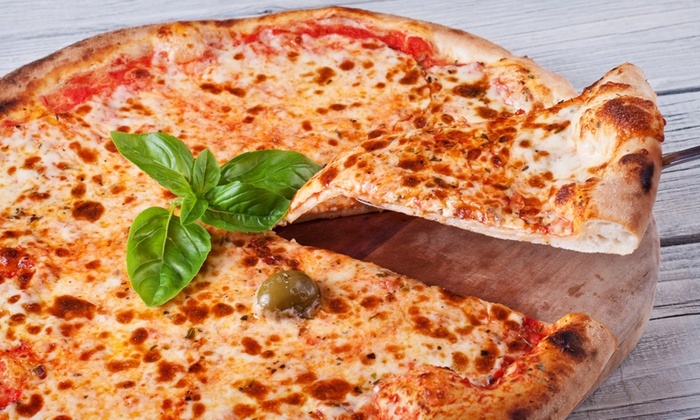 This process shows how many slices of pizza are remaining that contributes to the whole gap! It seems like a lot of time, it can be if you aren't an organization that track / measures very well. But this gives you the entire picture. It shows to you as a leader how many stakeholders I potentially need to involved and how many "city level" A3's I can disperse as training and development opportunities for a team or department. I think many feel they have to take everything on themselves. Another misnomer, we are only as good as we let our extraordinary people think for us each day. We have to foster that and find ways to manage all the gaps that are out there. It does come easier with having standards in place, either way you will get to improving a process. That is where the "extra cheese" lies. So next time you consider tackling a world hunger problem just remember we need to feed the cities first, just as you would prefer a slice of pizza at a time. 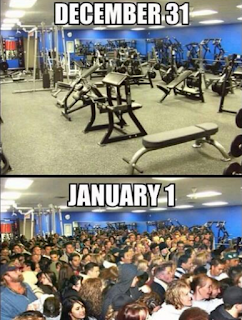 You can't spell "challenge" without "change"! Ernie and I were blessed to have many lessons from our Japanese trainers during our time at Toyota Motor Manufacturing. Some were purposely orchestrated for us to fail, some through detailed thinking, some during observations and some verbalized. The little nuggets that were often told to us were deeply valuable. We didn't always realize it at the time, it wasn't until we were in a situation that took us back to the moment when it was said. Then we had the "ah ha", and finally knew the greater lesson. Sometimes the discrepancy was our language barrier, but often times we couldn't grasp the metaphor or analogy they were using, but eventually it came full circle back and that's when you truly "got it", kind of like the muscle memory of riding a bike. For example, the word "nemawashi" was used quite often in our environment and we labeled it under the category of gaining consensus or getting proper buy-in. At a high level this is correct. In the way that a Japanese trainer may explain it you might find it to be a little more in depth. I can remember once my trainer describing it as "prepping the soil" to plant a tree. Of course I gave them a bizarre look, but they asked me to think about what is necessary for that to take place and for the tree to flourish. Well I articulated that process step by step to him (the trainer) and he asked me to think of the "tree" as an idea. How can we cultivate ideas on a daily basis and prepare them for sharing and applying among the team? As a leader we must always be prepping the soil, not only for an individual but for the team and how that cascades upward to the company. It's an important challenge everyone must embrace and connect their line of sight. I can vividly remember the moment I was given my team leader hat. In our culture the hat with a specific stripe color was a visual control for leadership. A blue hat with a brown stripe was a team leader, and a brown hat with a blue stripe was a group leader. These positions spent the majority of their time at or near the process supporting the team when discrepancies occurred. When I was handed by blue hat I remember my trainer saying, "Tracey-san", always be uncomfortable." I didn't totally understand this statement in the context of how he said it, but I could promise you as a 21 year old team leader I was uncomfortable those first few months(and continued to be). So no worries there (grin). 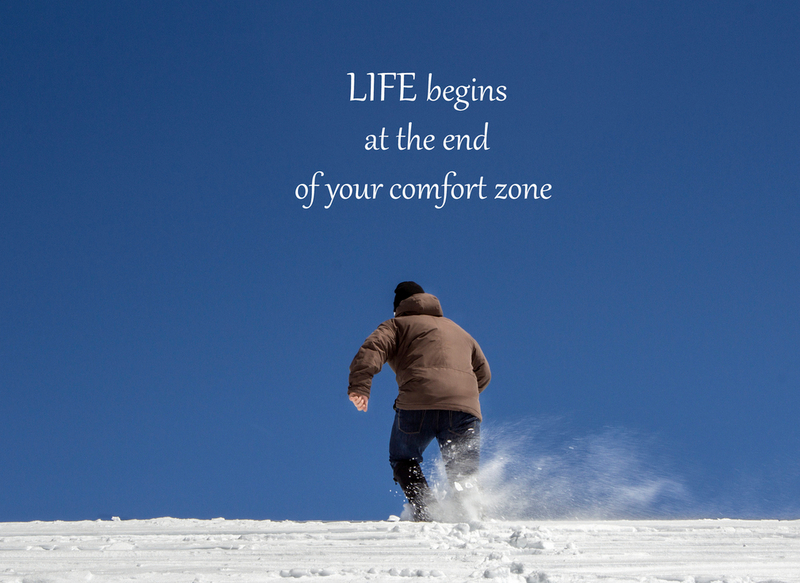 As I grew as a leader and an individual in this role I realized that uncomfortable was like being "challenged". That if an individual feels comfortable in their position each day then complacency can step in and then it becomes about putting my time in and going home. We don't want an environment that feels like a prison sentence, but rather a day full of empowering folks to challenge themselves. This means as a leader I/we have to do the same. Our trainers often referred to that as leading and learning simultaneously. This practice allowed us to learn but at the same time coach. How can this happen one might ask? Isn't it necessary for us to have the answers first? So I often say, just lead not from a position of power, but an empowering one. Often times you might have to say, "I don't know", and that is OK. You can say, "let's go find out together and learn". To many that might be uncomfortable at first because we have been conditioned as humans that the boss always has the answers. If they don't then they should be the boss, correct? This is a myth, one that is hard to change my lean thinking friends. If the work manages us each day and our people are going through the motions then we might as well turn their brains off and put a battery in. I will admit that the comfort zone is a vortex we can easily find ourselves sucked into, we cling on to the sides to not fall down further. It's not easy to climb out, but if we take it one step at a time we find that we can avoid the black-hole of comfort all together. This is a paradigm shift in thinking, it's not easy to put yourself out there without a back-up plan at times. Raw unplanned learning can often give us the most rewarding results. Being a preferenced introvert I can admit that I didn't really care for speaking in front of others in my earlier years. So my leader and trainer pushed me to do our KYK 5 min talks in front of our team. I was nervous at first that people would notice the tremor in my voice or how fast my heart was racing, but in time it became less difficult so I was asked to raise the bar. My next task was to join a Quality Circle, these were our problem solving teams that worked together (7-10 people) to solve problems in their specific area. You had to share ideas, follow PDCA, and then create new standard work with the team leaders if the ideas were valid through experimentation. After working through several activities I decided to enroll in the class to become a quality circle leader. This would challenge me at an entirely different level, I just wasn't responsible for myself, but now for a team. I had to not only guide (as a team member level), but coach problem solving and foster ideas. Little did I know I was developing myself for the next level. All this took place across a 3 year span, but slowly I was creating base hits preparing myself for a home-run one day. So from my experiences, which were many, I feel that the lessons I learned were layered like a wedding cake. Each layer of learning is foundational to the next. Without a strong foundation we can find ourselves on unstable ground. What we (Ernie and I) often find out there in various industry is the need to cling on but we know, what is comfortable. What we know is often what we hoard, create as our own, or what is easy for us. 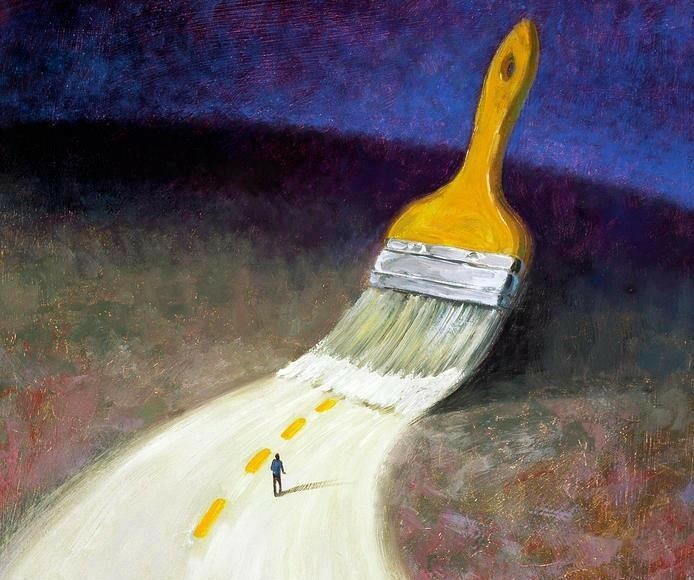 To walk down an unknown path can be compared to walking in the dark. But if we aren't moving the furniture each day (chaos) we can navigate through all the layers we created in the form of standard work and sustainable processes. This allows us to have a baseline to improve, in order to do that, we often have to challenge the status quo and build upon that tribal knowledge we have gained to create new and better ways we all can align with. When we align we cascade upward and downward hitting the KPI's the organization has set. When we know we are making a measurable difference, there is nothing like that base-hit. It really drives us to want to be at the plate more. So when I may find myself getting too comfortable with what I do or how I/we coach. 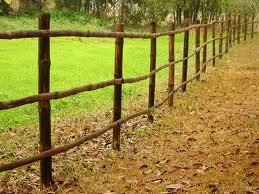 We challenge ourselves to find a better way, this keeps us on the value-add side of the fence. Never stop pushing, always be learning no matter what level you are! Not all of these are necessarily incorrect, but we need to understand the purpose behind each "walk" we may be doing, and how it fits into the "development of people" category. A question a leader (or anyone) going to the Gemba should always ask is - "What value are you adding to the organization by going?" Are we removing barriers and constraints for the people to do their process in the most effective and efficient way? Are we providing resources for people to be successful in problem solving? So what some of the key points to an effective Gemba walk? What are some (not all inclusive list) questions you should ask before, during, and after a Gemba Walk? What is the purpose for this walk? Who is attending the walk? Are there preconceived notions driving our thoughts? Are there standards (quality etc)? What is the process flow?- can you see it from start to finish? 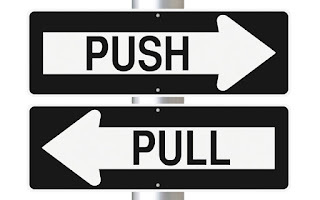 Do we see a push versus a pull? What is takt/cycle for the process? Is the process meeting internal/external customer expectations? Identifying 8 forms of waste? Are you seeing through the process (people are behaving differently because you are there). Did we engage with people? Did we provide resources for problem solving? What is the strategy for the next one? 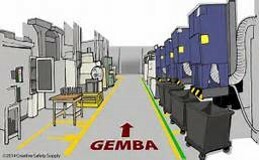 So to summarize, Gemba Walks are a essential part of a culture that focuses on developing people. It is the responsibility of all leadership to be the servant leader and remove barriers and provide resources for true problem solving to take place. Problems that are framed correctly are half solved, so finding the truth is crucial in completing the PDCA kanri cycle. If you take the time you will often find that where you think discrepancy lives, there is a vacancy instead when you discover the power of the Gemba. Utilize the extraordinary power of your people, they are one of the most important assets of your organization. This month I am #crossblogging to share with you a column Ernie and I wrote for The Lean Post at the Lean Enterprise Institute. Here is the link to it. Also the post below. How do we measure our progress in an organization? How do we know what type of indicators we are using and what do they tell us about the current state of our processes? How do we know when we get there? What do we raise the bar on to show improvement? These are just a few of the questions we hear from organizations that want to understand more about what data they are tracking and how they respond to what that specific information tells them. How much of it is truly value added to the company and customer? What we do is break down the key performance indicators (KPIs) that organizations track into two categories: lagging indicators and leading indicators. Lagging indicators are results-oriented, in that they appear after something has happened. Some would say they’re historical in nature, since they are often a reaction to something that has already taken place in a process, perhaps months ago. In the car industry, for example, this could be a warranty claim a customer filed with the dealership for a creaky suspension. As the manufacturer, it takes a lot more effort to know what actually happened to cause the problem and when. In fact, it’s impossible to go back in time to re-create the exact scenario that allowed the discrepancy to happen. This can often put us in symptom-fighting mode, also known as firefighting. This mode is not always sustainable, nor is it especially value added. Leading indicators, on the other hand, are KPIs that are tracking right at the process. This gives us a real-time measure as to when we may be out of standard or don’t have what is needed, when it’s needed, to produce our service or output. The beauty of leading (process-oriented) indicators is that while it can take months to get a report that tells the organization, “How are we doing?”, they can tell you what’s happening in the moment. So for example, let’s look at safety—say a team member gets injured during their work process. This gets documented on an incident-rate report in most organizations. So think about it – I am tracking an injury after it happened. This is a necessary process in the majority of organizations due to OSHA or other safety mandates, but now I have to ask myself, “What does this information tell me about the process?” If the actual incident happened 1-3 days before the report came out, are we able to know what really caused it? Maybe, but it won’t be easy. That incident-rate report is a lagging indicator. We find the majority of KPIs tracked are lagging (results-oriented) indicators. It seems to be a pattern across various types of industries – not just manufacturing. It is a common misconception that we should only track lagging indicators, as many feel they give us the most information. But isn’t it better to have a process indicator that gives us a predictive factor before the injury actually happens? That would be more of a leading indicator – and that is where you can shift the focus from results after the fact, to process in the moment. Given the above example, maybe there were trends that were overlooked. Perhaps someone mentioned “This flow rack is very high and I have to reach several times a day.” Maybe there was a near-miss incident that hinted at a larger problem. That information could be predictive to an injury, letting us address the problem in real time – not just waiting for something to happen before we take action. So, how do you start identifying your indicators? One way is to take a closer look at your daily processes. Asking questions of your team members about how their process is going and whether or not there are issues can help you grasp the situation of predictive measure versus reactive. One way we have seen organizations do this is a “how’s your process” check. This creates a daily touch-point so the supervisor can see if there are any issues with processes. This is then logged on a visual management chart for Safety and posted daily. If something goes wrong it gives us a very specific window of time to track the discrepancy. This check can greatly reduce incident rates by shifting focus to the process itself (leading) versus tracking only after a problem has happened (lagging). So if you want to stay out of an endless “firefighting mode” with a team of hose-holders, then it’s time to change viewpoints and analyze your available measurements of a process’s success. There will always be a level of reactivity in an organization and that is normal in most businesses. But to do business each day in a reactionary mode is not good for long-term sustainability and growth. The key is to bring awareness to the indicators at your business – and you can do this through gemba walks, problem solving, creating standardized work, and better visualization (e.g. what is the current state versus the ideal state through visual management?). The more people can see, the more abnormalities will surface, the more the problem awareness muscle can be strengthened, and your culture can finally start to change. For more information on leading and lagging indicators and their value in lean transformations, stop by Tracey and Ernie's Learning Session at the 2016 Lean Transformation Summit in Las Vegas this March. They will be joined by three of their clients from a lean transformation at Nevada's Kinross Gold Mine, in which using KPIs was critical to success. Learn more about this and other Learning Sessions on the Summit webpage. Yes-- we look for Lean examples, Standardization, and JIT even on our vacation time! Well Ernie and I were able to work in some vacation time to Hawaii this month (Jan). It was my first trip there and Ernie's second. We visited 2 islands (Oahu and Maui) and I have to say it was amazing and I hope to return one day-truly paradise for me. I wanted to dedicate a blog post to "lean even on vacation" to illustrate no matter how much I try to get away from it, it's really just intrinsic to who I am (we are). It was also a way to share a bit of our fun with a lean flare. So as we arrived at HNL airport we noticed the awesome visual control system in the rental car garage as we exited. They had people/movement detectors connected to flashing stop signs to let a driver know when someone was walking across giving them a leading indicator to stop in time. There were several blind spots so this was a very good visual management countermeasure for safety. Once we arrived at our hotel in Waikiki we made our way to the elevators and recognized technology that assisted with level loading process to help prevent wait time by a guest. We have seen different versions of these with our travel but this one never allowed us to wait past 10 seconds--very efficient. Once you enter your floor then it display which "specific" elevator door you should get on. There were 8 different elevators in this area. I would be nice to yokoten this idea putting in place in larger hotels everywhere :). We saw various examples of 5S, but one I don't believe I have witness before was the "sweeping" of the beach. Since we were acclimating to HST time, we had the pleasure of watching the sunrise over Diamond Head. We noticed there was a beach sweeper (similar to an ice rink cleaner removing the marks and refreshing the ice). The beach sweeper removed all the foot prints and sand artistry made the day before. I was impressed and said "they 5S'ed the beach"--a fresh beach each morning to walk on. I jokingly said, it looks like "vacuum marks" on a carpet. Next we were honored to visit the Pearl Harbor Memorial. What an emotional experience. We found that there was lots of standardization here. The U.S Navy was a integral part of the entire process. There were only 1300 tickets given out each day, and there are hourly trips outward to the memorial with a specific amount of people allowed each trip with a return of folks ready to leave, loading and unloading had a process to follow. As we sailed out silently we were only allowed to use our phones while sitting with only use of the camera function. Out of respect, we were instructed to have minimal discussions and if so very quietly. No texting, or phone calls from the memorial, most were very compliant. 3. FAA is present inside the crater for communication with the US Coast Guard, Civil Defense and Emergency Services. 4. 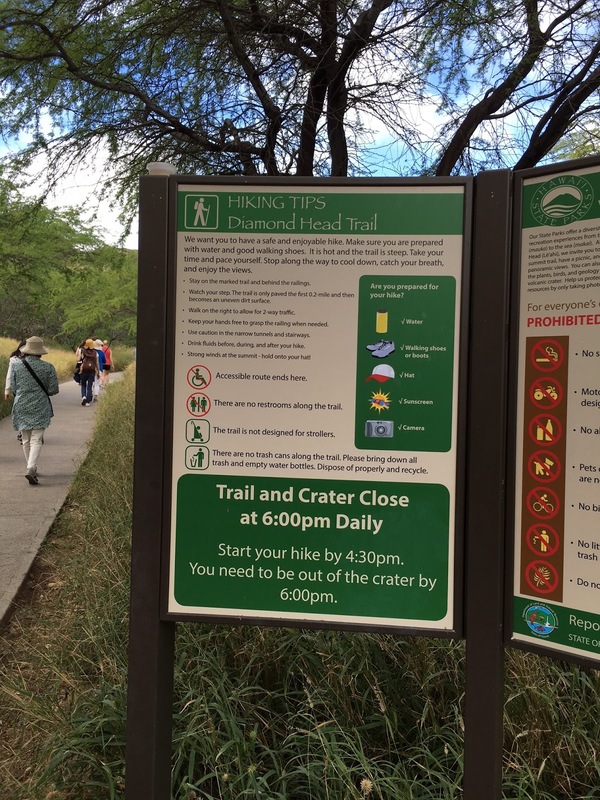 No one is able to begin the hike past 430pm since the park strictly closes at 6pm. 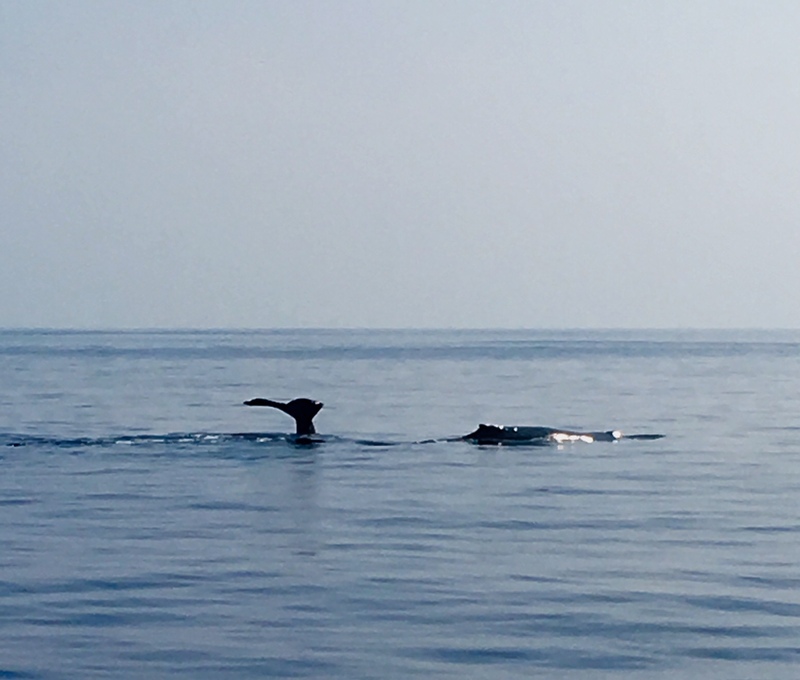 We had the pleasure of getting an hour to swim with dolphins- a bucket list item for me. Part of their protocol included us sitting and discussing our outcomes of the visit and also to learn about the dolphins, their personalities and environment. They actually said the dolphins will choose us. We were given a level of Job instruction training in regard to feeding, holding, petting and swimming with them. We all wanted to be in a safe environment including the dolphins since we were in their "home". It was interesting to learn hand signals to direct them as they followed a process. Their trainers were amazing, and it was a very unique experience--one very standardized in all areas especially safety. On this trip we experienced for the first time flying Hawaiian Airlines. What an interesting airline. We have been used to flying Delta all these years and they are an affiliate of Delta airlines but their standardized work was a bit different. It was interesting to see a different process and learn as we went through it. 1. The Kiosk process was all inclusive, you not only signed in and printed your boarding passes but you also weighed and tagged your check bags. 2. Only about 1/2 the staff was needed since everything was done by the customer. 3. On the plane the refreshments were a foiled 4 ounce drink that was given to everyone, and the trash collected within 7 min making it a very efficient process/service- no cart necessary in the aisle. 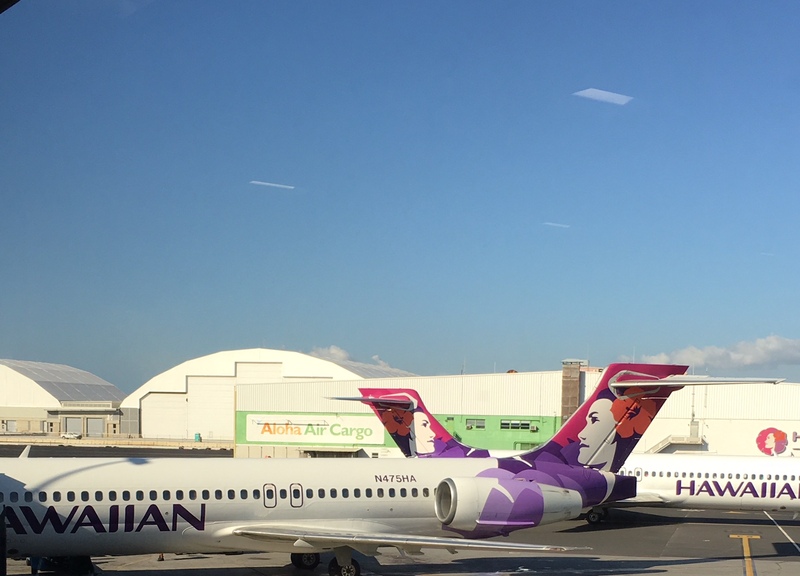 I'm sure it may be different for their longer flights, but their island to island flights were practicing lean in many ways. Another excursion of ours was whale watching, this was an experience to say the least. We learned a lot about whale population and routines throughout the year. The boat we were on had specific standardized work for us all to follow. 1. No one was allowed to walk around until we were clearly out of the harbor area. 2. When you stood up to observe you had to have a 3 point contact to walk around safely due to waves/swell. 3. When aboard the boat you refer to the back of the boat as the stern/aft, the front as the bow, the left side as the port, and right is starboard. Honestly, it was difficult to remember it all, but part of their process. 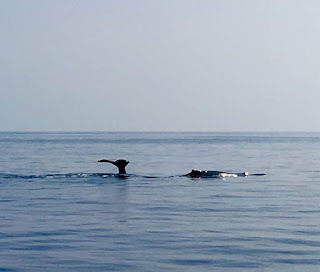 If we spotted a whale we had to refer to the area of a clock they were at with the front of the boat being 12 o'clock. This was necessary for quick reference not to miss a shot if all possible. 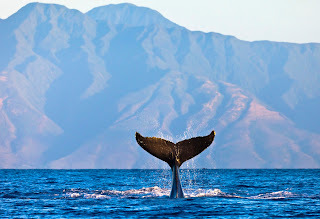 The whale are definitely unpredictable and on their own schedule, but so majestic! Priceless! How many have eaten a pineapple grown in Hawaii? I am not a pineapple fan, but grew to enjoy them while there. There is nothing sweeter than these and you can find them added with many different foods on the islands. While visiting the Dole plantation we learned there was a specific process for cutting a pineapple. They had a demonstration every hour to share their standardized work and also free pineapple. They taught us how to minimize some of the waste by not eliminating all the core which many do (tribal knowledge I suppose), and how to lessen the acid once freshly cut. It was a process we hope to replicate in the future. Tribal knowledge can be a good thing if "shared wisdom" is involved. We met Una who was a local on Maui his entire life. 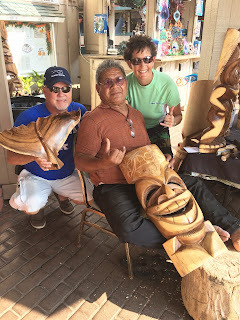 He learned his carving skill (standardized work) from his father, and has know passed on his knowledge to his children who now carve with him as needed based on demand. We were blessed to get to see him finishing a piece we purchased as a keepsake along with a symbolic whale tail which can mean strength. We learned that standardized work with the Hawaiian Koa wood is very specific and timely in order to produce high quality items. It was very interesting to hear about the Job instruction training between him and his father and with his own children. 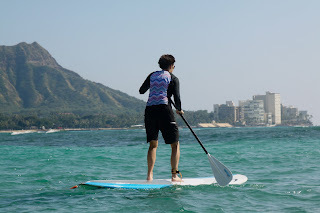 Lastly was a great example of standardized work and job instruction training involving myself in regard to a paddle board lesson (my very first). 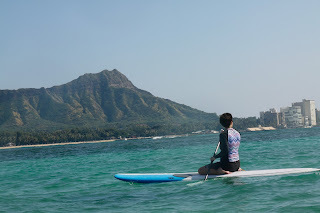 For 4 days we were unable to rent a paddle board due to the swell and currents. Once it calmed and shifted I was able to take my first paddle board lesson. Little did I know there was so much involved in sustaining this process (meaning not falling off into the water). I had witnessed many folks even on the rough ocean days paddle with no issue and made an assumption that it would be fairly simple. Boy was I mistaken, until you experience the facts about a process, don't make an assumption. Go See! First my instructor and I started on the dry beach practicing what I would do when I got into the water. So we did this for about 10-15 min preparing. Once I was able to remember some essential standardized work steps we went out into the ocean to begin the process. 1. 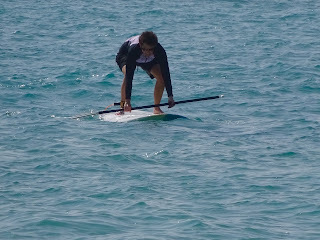 First was to just get on the board and sit properly, paddle correctly and practice turning. 2. 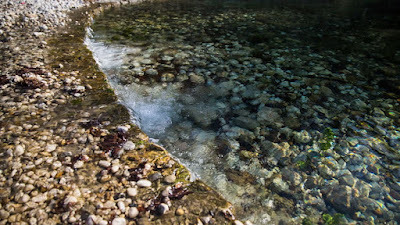 Secondly, to get a feel of the water and currents and learn where to go and not to go do to the shallow waters, rocks and reef. Once I developed confidence sitting and paddling I was reminded of the standardized work process and asked to paddle on my knees as I felt comfortable doing. As you can see my instructor directly behind me, telling me what key points I am not following exactly and how to improve. It was a great example of JIT. When you are out there its hard to remember all the nuances, it was great to have the reminder in the ear as I was learning and doing simultaneously! I spent a little while getting used to paddling and turns and was told when I was ready I could stand. Now mind you, there was a specific process for this that created the most sustainability for staying on the board. So I followed the standard work process to the best of my ability being my first time. I got the board moving and began to stand. I will admit it was very awkward and have a whole new respect for paddle boarders and the leg muscles it takes along with upper body. Wow! As you can see I did my best to replicate the process they taught me, I was a bit shaky but was able to recreate the process and stayed on my feet without falling off (a goal). From this point I was up and down continuing to learn to sustain the process. I was out for almost an hour and my fun was over, but I felt my body was spent and my legs were pretty sore for the flight home. A good workout to say the least. As I reflected it was a all about my instructors training technique and my ability to listen. Something we can all improve on. Overall we found a lot of examples of lean, standardized work, problem solving, waste awareness, level loading, safety, 5S and many other lean aspects. It was a great trip and I thought I would share a bit of our experience over our 10 day trip! Hope you enjoyed! Remember lean is all around us, just look closely! Have fun with it! We do! !